GSM Automotive is a leading global Tier 1 manufacturer of decorative interior & exterior components and assemblies with a heritage reaching back over 100years. Today GSM has a manufacturing footprint which now extends over 2 continents as well as a diverse product portfolio which spans the spectrum from a simple engine label to the precision engineered complex innovative illuminated assemblies which we now produce on shop floors globally. GSM Automotive in Brecon, Wales, a key supplier to Jaguar Land Rover, were experiencing exceptionally warm conditions on their shop floor, affecting production and making working conditions extremely uncomfortable. The ideal solution was to find a cooling system that allowed naturally fresh air into the building, giving workers fresh natural air to breathe as well as cooling the shop floor for production purposes. Providing the ultimate fit to the solution, EcoCooling were able to use the EcoCooling evaporative coolers to help remedy the high shop floor temperatures. 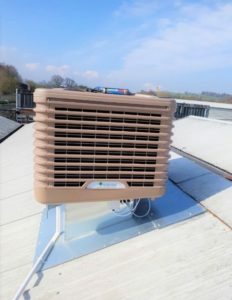 Two EcoCoolers were installed along the roof including two roof-mounted extraction fans, allowing for ideal shop floor cooling. EcoCoolers contain an inbuilt fan and evaporative cooling pads. The evaporative coolers are designed to be externally mounted and should be used as part of a mechanical ventilation system with a paired extract fan. The standard configuration is downflow, where air is supplied from the base of the cooler into the area that requires cooling. Both systems are controlled by individual controllers, incorporating timeclocks (enabling free cooling at night). The 2-speed wall control is supplied as standard with the evaporative cooler, this is normally connected to a thermostat to give automatic control. The controller provides an integrated commissioning and maintenance cleaning sequence which provides a fault alarm code. 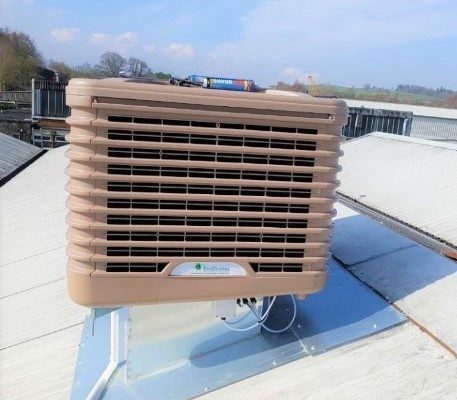 GSM Automotive were considering using traditional air conditioning to cool the area, however, when compared to the EcoCooling system, the operational running costs resulted in massive savings. The EcoCoolers will cost less than £195 per annum to run, in comparison, trying and cool such a large area with Air Conditioning, this would have cost over £3,266 per annum to operate. The massive saving for the company also provides an environmentally friendly solution which reduces the companies carbon footprint.